Humans and horses have partnered for thousands of years. Before the advent of the internal combustion engine, equines were the major source of transportation and motive power. Today, horses still serve in work roles but are just as common for sport, recreation and hobby. Even as companion animals, they're considered livestock. The horse with one owner throughout life is the exception. The horse's life cycle, from birth to death, lasts approximately one-third the length of the average human life span. After an 11-month gestation, a mare gives birth to a foal. The newborn stands and nurses within a couple of hours after birth. He'll spend the next several months at his mother's side. 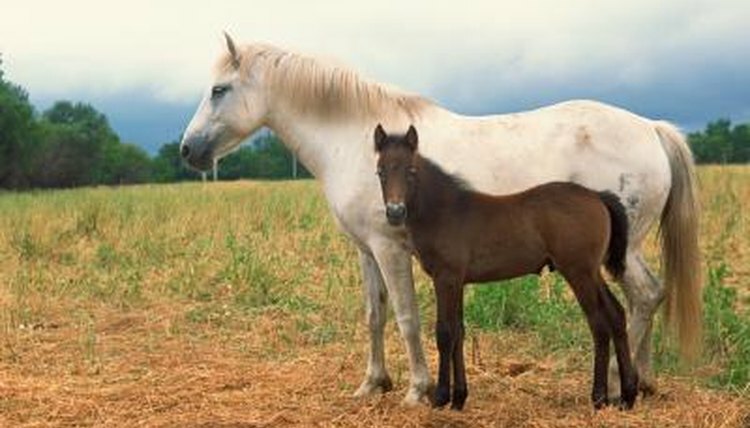 Broodmares and their foals should spend most, if not all, of their time out on pasture with other mothers and babies. The foals can exercise, building bone and muscle, while learning how equine society works. Weaning occurs between the ages of four and six months. Between the ages of 1 and 2, most male horses will be gelded, or castrated. Relatively few horses are kept as stallions, as they are usually harder to handle and many boarding stables won't accept them. Most equines spend their first two years growing and learning the basics, such as tying and standing for grooming and bathing. By the age of 2, most horses are close to their mature weight and height. Basic training starts with foals, who are halter-broke and taught to lead. Depending on the breed of horse and its discipline, more intensive training begins about the age of 2. Many racehorses start their careers as 2-year-olds, while reining and cutting horses are in training by that age. Other disciplines and breeds wait a bit longer. Late-maturing warmbloods, the sport horse of choice for dressage and jumping, are usually not ridden until the age of 3 1/2 or 4 years. No matter the breed or discipline, solid training is a must for any horse. A horse with training has value that an untrained animal does not. A horse's prime is generally between the ages of 5 and 15. Most breeds are fully mature by the age of 5 and the horses are starting their careers. Like any athlete, horses need conditioning to perform without overextending themselves. Even horses just ridden for pleasure can hurt themselves if they're expected to hustle hard on weekends. Unfortunately, because horses are expensive to keep, animals with serious injuries are often euthanized or end up in bad situations. Speak with your vet and trainer about the right exercise program for your horse. By the time your horse turns 20, he's a senior citizen. That doesn't necessarily mean he's ready for retirement. Like people, older horses vary in their health and activity level. Many geriatric horses can still perform a job even if they're not in their prime. For example, a former show horse might no longer school over fences regularly, but he's fine for going out on a relaxing trail ride. Horses who have been on regular worming and dental programs, and receiving good farrier and veterinary care, throughout their lives usually fare better in old age than those who received less attention. Older horses might benefit from joint supplements for arthritic stiffness and pain. They might also require dietary changes as their ability to chew decreases. Ask your vet about supplements and feed changes, including feeds designed for the senior horse. It's not unusual for a horse to live to be 30 or older. How Long Is an Average Equine's Life Span?